Enclose an outdoor swimming pool with a steel frame-supported structure. Needed to directly attach to a conventional building that houses changing rooms and other amenities. 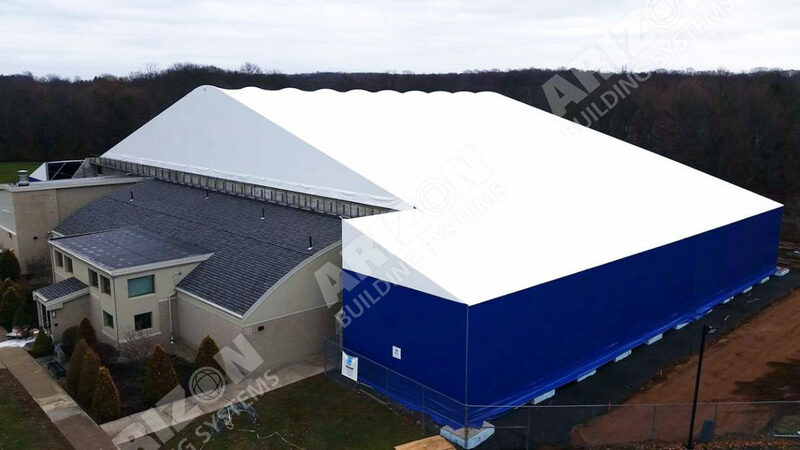 Arizon designed, manufactured and installed an open-span frame-supported structure that fits over the Town of Cheshire’s outdoor pool. At 235 feet wide, the structure is the largest of its kind to be constructed over a swimming pool. The facility features Arizon’s energy efficient Air-Rotation mechanical equipment to ventilate and heat the interior during the harsh Connecticut winter. Area residents now have an indoor aquatics facility for year-round competitive, recreational and leisure swimming. Energy efficient lighting and HVAC options were considered in the design to ensure that the community is not burdened with high utility costs.